The innovative Quick-Fit Harness is the answer to every dog's (and their owners) dreams. One click of the buckle on the Quick-Fit and the dog and owner are ready to go. The support of a harness, the simplicity of a collar. The EzyDog Quick Fit Harness is the perfect solution for dog owners who want the benefits of a harness with the fitting ease of a collar. EzyDog Quick Fit Harness sizing chart. Why Choose a Harness over a Collar? The benefits of a harness are numerous. Control, safety, comfort, and the overall enjoyment of the daily walk are all advantages of a harness compared to a collar. Typically the most common complaint of harnesses is the difficulty of fitting and taking off. This difficulty for many dog owners overrides the benefits of the harness and as a result the walking experience is not what it could be. The EzyDog Quick Fit Harness allows you to easily slip the harness over the dog's head and clip the one and only buckle securely behind the front legs. This simple process has eliminated the difficulty of fitting a harness. A unique one time size adjustment across the chest panel allows for a custom fit. Just slide the protective neoprene chest panel to one side and use the Velcro straps to make the adjustment. If the red line shows after the proper adjustment is reached, then the next larger size is needed. Select size based on girth. Reflective stitching allows for nighttime visibility to increase safety in the dark. The grab handle provides convenient access to maintaining control. The ring for leash attachment slides effortlessly across the grab handle to aid in keeping the harness movement limited during walks. 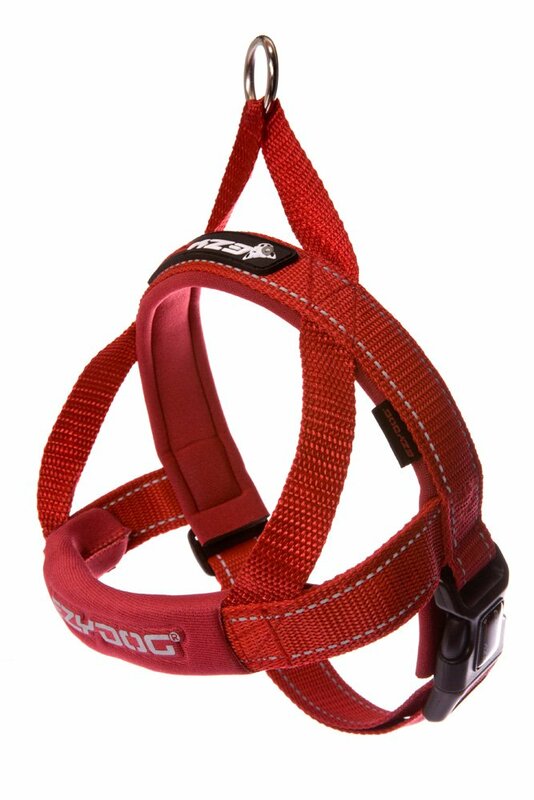 An id ring attachment truly makes this harness a collar replacement.